Are your gums red or swollen? This common dental issue can have many causes, with some more serious than others. That’s why it’s important to be proactive if you notice you have gum inflammation. Contact your Boiling Springs dentist if your swollen or red gums last longer than a few days. Until then, you can identify the possible causes and give yourself some relief before your appointment. 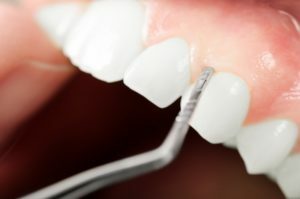 Read on to learn what may be contributing to your red or swollen gums and how you can help before seeing your dentist. What is Causing My Red or Swollen Gums? Gingivitis: This is the first stage of gum disease, which is usually caused by lack of routine brushing and flossing. Poor nutrition: Vitamin C deficiency can cause gum inflammation. So, if you haven’t been eating your fruits and veggies, your diet could be the cause of your inflamed gums. Medications: If you’ve recently started taking a new medication, one of its side effects could be swollen gums. Talk to your doctor about your medication to see if it’s a cause and if there are alternatives. Brand switch: If you have recently changed your brand of toothpaste or mouthwash after long time use of other products, your gums may be reacting to the change. There are a variety of causes of gum inflammation, but these are the most common. The best way to know for sure is to schedule an appointment with your dentist in Boiling Springs. They will be able to give your mouth a careful examination and find the root of the problem. What Should I Do for Relief? Brush and floss: Regular brushing and flossing is the first step to recovering from gum disease or other infections. Brush twice a day and floss once to remove plaque and bacteria from your smile. Improve your diet: Adding extra fruits and veggies while avoiding sugary snacks and sodas will promote gum health. Use salt water: If you’re experiencing pain or discomfort, rinse your mouth with a warm saltwater solution to ease pain. Avoid smoking or using tobacco products because they can irritate your gums even more. Take action as soon as you notice a problem because waiting will only lead to more severe issues down the road. Don’t use products that are irritating your gums. Change your toothpaste and/or mouthwash if you think that those products are the cause of your discomfort. Now that you know more about gum inflammation and its possible causes, give yourself the oral healthcare that you deserve. Visit your dentist to prevent more serious issues and keep your gums healthy. Dr. Thomas Neslund and Dr. Eric Weed are a team of dentists with a passion for quality dentistry. They believe in patient education, which is why they want you to know what may be causing your inflamed gums. They currently practice at Carlisle Family & Cosmetic Dentistry, and they can be reached through their website or by phone at (717) 258-5455 for any questions.